Welcome to the Washington Public Bank Coalition! Our goal is to provide you with information on the benefits of creating a public bank to finance public projects, such as public public schools, rather than financing public projects through private Wall Street mega banks. The safety of one million school children in our state depends on replacing one thousand crumbling school buildings. The best and least expensive way to build these urgently needed schools is by creating a public bank. Our hope that you will join with us to support the establishment of a public bank here in Washington state so that we can begin to build these urgently needed schools - financed entirely by repealing tax breaks for billionaires - and without placing additional financial burdens on local homeowners. A public bank is a bank that is established to operate for the public good rather than for private profit. There are many public banks in nations around the world. In particular, public banks were responsible for the restoration of economic prosperity in Germany after the devastation of World War Two. Due to the corrupting influence of greedy Wall Street banks, the only public bank in the United States is the Bank of North Dakota – which was established by conservative farmers in North Dakota to free their state from the economic control of powerful East Coast Bankers. Despite many attempts by Wall Street bankers to kill the Bank of North Dakota, it has thrives and allowed North Dakota to be free of the debt slavery imposed by Too Big to Fail banks. Each year, the Bank of North Dakota returns millions of dollars in profits to the people of North Dakota – in addition to providing low cost loans for the building of public schools and public roads in North Dakota. 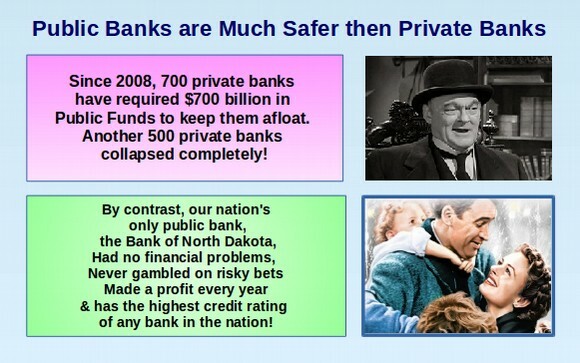 Best of all, the Bank of North Dakota is the safest bank in America. It does not engage in risky “credit default” speculation and it has the highest ratio of assets to liabilities of any bank in America. Why do we need a Public Bank in Washington State? We have gone for more than 100 years in Washington state ever since we were granted Statehood in 1889 without a public bank. So why do we need a public bank now? The answer is that our state is facing economic problems which are greater than any time in our history. Over half of public schools are more than 50 years old. They do not meet earthquake codes or health codes. They are so unsafe that they place the lives of 500,000 students at risk should a major quake occur while the children are at school. It would take more than $30 billion to replace all of these crumbing schools. We also have a $20 billion road construction and repair backlog. Half of our bridges are also more than 50 years old and would collapse in the event of a major earthquake. We are already paying more than $2 billion per year just in interest payments to Wall Street banks from past loans. We as a State simply cannot afford to continue squandering billions of dollars every year to payments to greedy Wall Street bankers when a public bank would allow us to build public schools and roads with no interest charges. Below are just a few of many benefits of creating our own public bank. First, we could build schools and roads for half the cost – or build twice as many schools and roads! The concentration of wealthy and power in the hands of Wall Street banks is greater now than at any time in our nation's history. The difference in cost between what Wall Street banks are able to get from the federal government versus what they charge states is the highest in history. Wall street banks get money at near zero percent interest and charge our State, cities and School Districts 4 to 5 percent interest – even though no city or school district in our state has ever defaulted on a loan. The prices were are being charged in interest by Wall Street banks amounts to robbery. The only reason they get away with it is that the big banks are a monopoly. A public bank would allow us to build public schools and public roads without being fleeced by the private Wall Street banking monopoly. Currently almost half the cost of all public schools and roads goes simply to pay off the bonds of the Wall Street banks. If we loaned the money to ourselves, we could eliminate these greedy bankers and return the money to the tax payers by lowering the cost of public projects. Alternately, we could build twice as many public projects with the same amount of money. Second, we could lower local property taxes. Because our state is at the debt limit, the state school construction matching funds have fallen from 67% of the actual cost of building schools in the 1980s to less than 10% of the actual cost of building schools today. As a consequence of the state failure to help build schools, local homeowners have been forced to pick up the difference through skyrocketing local property taxes in order to pay off the Wall Street banks in a vicious cycle of debt induced slavery. If we had a public bank, there would be no need to increase local property taxes – in fact, we could cut local property taxes in half. Eventually, we would become like North Dakota which has virtually no debt and therefore has very low taxes. Third, starting a public bank would allow us to create more than one hundred thousand new good paying jobs – building the schools our kids need and the roads that the rest of us need to get to and from work. Fourth, we could reduce our dependence on greedy corrupt Wall Street banks. The reason Wall Street banks were given billions of dollars in bailouts in the past few years is because we do not have a public banking system to fail back on when private for profit banks go broke. Starting a public banking system will allow our economy to grow even if the greedy Wall Street banks gamble away all of their profits and go broke. 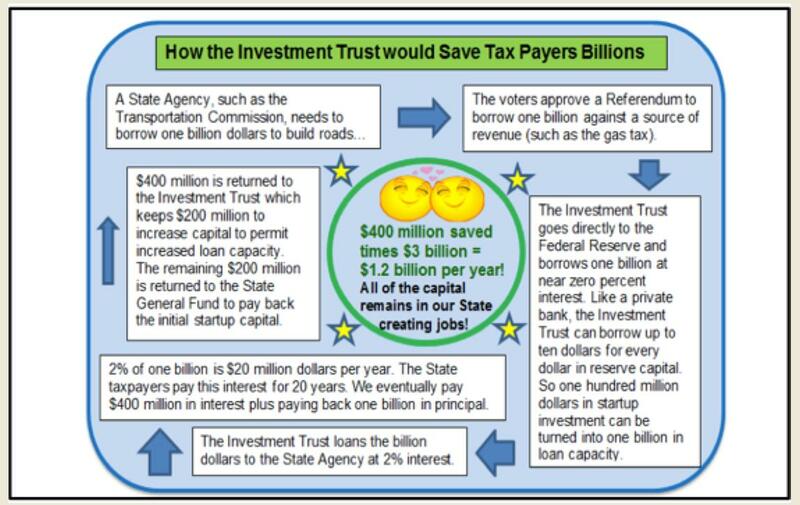 It is much safer to invest our tax dollars right here in Washington state helping build our local schools and roads than to hand our money over to Wall Street bankers who will gamble it away in a reckless drive to maximize profits. Do you know where your Washington State tax dollars go? When you go to the drugstore to buy some aspirin for the headache you got watching too many false and misleading ads on TV, the store adds 9.5% of the price to your bill. That money is collected and used by the State of Washington to pay for schools and social services. But before the state uses the funds for their intended purpose, did you know that all of those billions of dollars go into an account at Bank of America? This basically billions of dollars of free money that Bank of America uses to increase their corporate profits. This is the same Bank of America that is now considered “Too Big to Fail” and that you and I paid billions of tax payer dollars to bail out when they recklessly gambled with depositors’ money and lost it on speculation in financial schemes such as collateralized debt obligations and mortgage-backed securities. This is the same ruthless Bank of America that is now foreclosing on tens of thousands of Washington State residents, all the while skirting its obligation to re-negotiate underwater home loans in good faith and using “robosigners” to pretend to hold notes that were sliced diced and discarded years ago. A Washington State Public Bank would allow us to keep our state tax dollars out of the hands of these greedy, lawless Wall Street bankers. Clearly, our current financial systems, nationwide and in Washington State, aren’t working. The gap between the rich and poor is growing; worker lay-offs and state deficits are increasing, and many, many people need jobs. Our current banking system is directly connected to big banks. On August 31, 2010, Washington State had 67.8% of its current deposits of $5.4 billion dollars in nine private banks that are headquartered outside the Northwest. Most of our tax money is deposited in the Bank of America. These private banks are in business to make profits for their owners and their shareholders. These 9 banks directly benefit from holding Washington’s state revenue on their balance sheets. They are able to leverage that money (multiply it many times) to create new loans, including out of state loans and to invest that money on Wall Street. Our State’s tax payers pay interest to Wall Street Bankers in at least three ways. First, we pay about one billion dollars per year from the State General Fund to cover the interest on loans from State public projects. Second, we pay more than one billion dollars in interest on public projects funded through local governments like cities and counties. Third, we pay more than one billion dollars in interest and principle payments for local school district school construction bonds. The total bond payments, for all three bond sources for public projects by all tax payers in Washington State, exceed $3 billion per year. By contrast, thanks to having their own public bank, the State of North Dakota has no bond payments and has no budget shortfall. 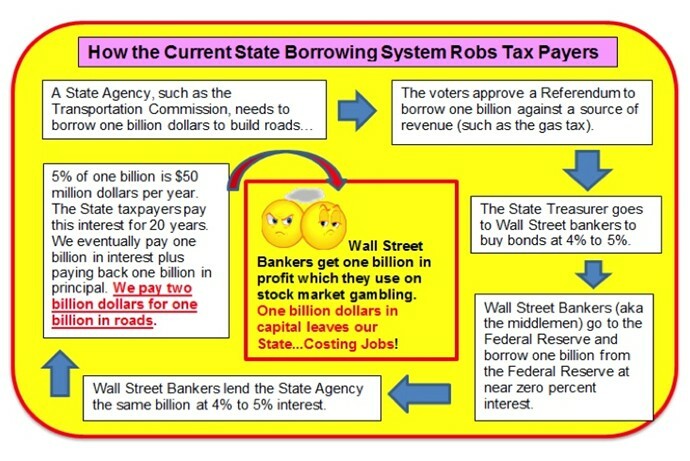 Currently, taxpayers in our State pay about 5% interest on these $3 billion in bonds to Wall Street Bankers. This is an unreasonably high interest rate given that Wall Street banks are able to get the funds to finance the bonds from the Federal Reserve for near zero interest rates. If we financed our own public bonds, we could likely cut the interest rate in half, saving our State’s tax payers more than one billion dollars per year in interest payments on bonds – simply by eliminating the Wall Street middle men. Instead of banking on Wall Street, Washington State needs to bank on Main Street. The answer lies in Public Banking. Simply put, Public Banks put state tax revenue, investments and assets to work on Main Street, not on Wall Street. Click on the other pages on our website to learn more about the drawbacks of continuing to borrow money from Wall Street banks and the benefits of creating our own public bank. Then click on the Join Now button to join with us in creating a public bank here for Washington State! Together with the help of a public bank, we can restore economic prosperity here for everyone. If you have any questions, feel free to contact us by clicking on the Contact Us link at the top of this page! David Spring M.Ed & Elizabeth Hanson M. Ed.